May 31, 2013 | 8:03 a.m.
Jim Sullivan (left) from the Employer Support of the Guard and Reserve, and seminary student and Army National Guard 2nd Lt. Lindsay Stohr present the Patriot Award to Ross Jahnke (right) of Bethel Seminary. Ross Jahnke, assistant dean for academic affairs at Bethel Seminary, recently received the Patriot Award in recognition of the support he provided to seminary student and Army National Guard 2nd Lt. Lindsay Stohr while she was an active service member. Stohr nominated Jahnke for the award, which is administered by the National Committee for Employer Support of the Guard and Reserve (ESGR). 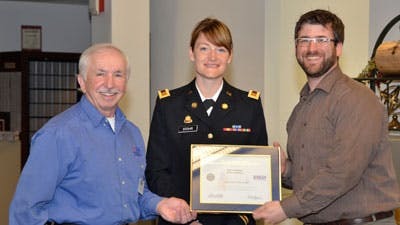 Jim Sullivan from ESGR presented Jahnke with the award in May and explained that the Patriot Award recognizes employers who make an effort to support Guard members by accommodating flexible schedules, time off before and after deployment, and caring for families. According to Sullivan and Stohr, this award will help other military members recognize Jahnke as supportive and someone who will help them to succeed in the workplace. “I have worked in a lot of places in the time I’ve served in the National Guard. A lot of employers have been respectful, but not happy about me serving,” said Stohr. “It makes it challenging and there were sometimes things I couldn’t go to because of work, which created conflicts. But there has been no conflict here. The seminary and Ross have offered me flexibility and support through the whole process.” Stohr will spend the next three months at Fort Jackson, S.C., for chaplain school.